Did the Bourbons Come from Troy? In what follows, I have greatly guillotined dynastic family trees, successions and time-lines. If that makes your blue blood boil, I'm sorry (but not overly so); on the other hand, if it is still too complicated for you, then you are just an old lower-case republican at heart. Whatever the case, I shall work back from the present. There are still Bourbons on the thrones of Spain and Luxembourg. In Italy, Bourbons ruled the Duchy of Parma and the Kingdom of Naples before the unification of Italy. The Bourbon dynasty took over (and founded) the kingdom of Naples in 1731 through the accession to the throne of Charles III. This was after a very complicated series of wars and treaties to decide what would happen to the bits and pieces of the former Spanish Empire (gone defunct when Charles II, the last Hapsburg ruler of Spain, died in 1700). With the exception of Napoleonic interruptions, the Bourbons ruled Naples until they were dethroned by the unification of Italy in 1860. Charles III's father was Phillip V of Spain, a Bourbon who had come to the throne of Spain in 1700. Before that, the Bourbons ruled in France, where they provided monarchs from Henry IV (1553) until Louis XVI, who was overthrown and beheaded by the French Revolution in 1792. Before that, the Bourbons were simply a noble line that got lucky. The ancestral home of the Bourbons is just a bit to the east of the geographical center of modern France. It is near a point in a hilly area where the Allier river flowing from the south joins France's longest river, the Loire. 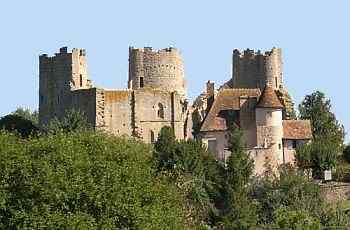 The town that contains the ancestral castle (photo, above) is called Bourbon-l'Archambault today. The modern provincial capital of the area is Moulins; 25 km from that town are two sulfur springs known even in Roman times as Aquae Borbonis (or Borvonis). (Beyond that, the etymology of the name "Bourbon", itself, is obscure.) In the early ninth century, the area was feudal property of the counts of Bourges, and the Bourbons, themselves, were vassals. The descendants of Aimar were a long string of counts called Archambault (from "Herkinbald", an ancestral name in the area). They married into the ruling family of France, the Capetians, thus turning the Bourbons into what is called a "cadet" branch of the Capetians. The House of Bourbon actually went extinct for lack of male issue until one of the Bourbon nieces married Robert of Clermont, a son of the king of France, Louis IX (1214-1270), known as Saint Louis, (father of the Blues, no doubt because of his immortal death-bed proclamation, Ego contemno video vidi visum occasus—roughly, "I hate to see the evening sun go down") and the only French monarch ever to be made a saint by the Roman Catholic church. That primed the House of Bourbon to take the throne eventually, which they did in 1553 in the person of Henry IV, the first Bourbon king of France. That much is reliable. There are a few legends that cover the period before that. They are just that —legends; they may or may not be founded in fact, but in any event they are too interesting not to repeat. One says that in the 5th century, a few thousand people from the northern Adriatic coast of the Italian peninsula, fleeing Attila the Hun, left their homes and sought refuge in the area of the above-mentioned Aquae Borbonis. Somewhat later, they returned home and started to build their own safe haven on some low-lying islands—a city that we now know as Venice. Another legend says that the first Bourbon lord was none other than Hildebrand (also, Childebrand) of the legendary sixth-century tales written in Old High German that figure prominently in later Arthurian literature.